A horror/adventure novel set in 14th century France, in which the Great Pestilence (a real historical event) becomes a “zombie plague” in the vein of Dawn of the Dead, or 28 Days Later (a completely un-historical addition for dramatic effect). In the year 1348, a dreadful plague reached the shores of Europe. Contemporary writers called it “The Great Pestilence.” Historians refer to it as “The Black Death.” And clinical researchers assume it was a pandemic outbreak of Yersinia pestis, or bubonic plague. But none of these descriptors reveal the real horror of what happened in that time — the time when death walked the land to consume the living. Aetate mortuum. The Age of the Living Dead. Now, a long-lost chronicle unearthed in the vaults of Termes, a rural castle near Bordeaux, France, at last sheds light on the real story. Its author tells of events so shocking, so terrifying, that they are almost beyond belief: the dead rising from their graves, the infected roaming the land to feast on human flesh, and the few remaining survivors locked in a desperate battle for their own safety and the salvation of the world against the onslaught from hell. For centuries scholars believed that artwork from the 14th and 15th centuries depicting skeletal danse macabre “death figures” were nothing but metaphorical images of mortality and suffering. But as this tale reveals, these were not merely whimsical depictions of the Grim Reaper – these illustrations reveal an actual war against the walking dead. 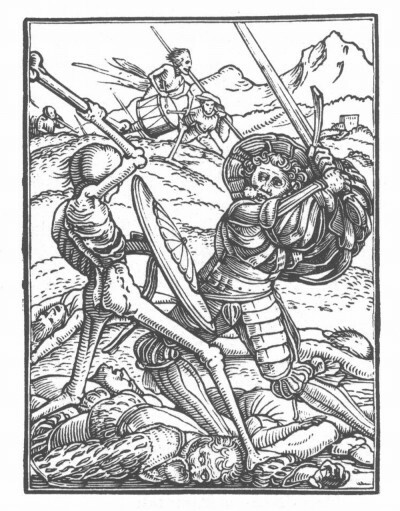 The illustration of “death and the knight” by German artist Hans Holbein (shown above) takes on an entirely new meaning when considered alongside the events described in this journal. Now, as scholars parse out the details of this terrifying plague, facts are at last coming to light as we learn about the true events of the year 1348: How one small band of survivors stood behind castle walls, with naught but their swords and their wits to keep them alive, and held the legions of the walking dead at bay. This is the story of the Age of the Dead. Coming soon!